This Mediterranean Couscous Salad makes a perfect light lunch, meatless meal, or side dish. Prepared with tomatoes, spinach, white beans, and fresh lemon juice, this fresh Mediterranean style dish is not only delicious, it is easy to make. I often find myself looking for easy, healthy side dishes to serve my family at dinner time. Couscous makes a perfect side dish for busy nights, as it cooks in just minutes. But it can be a bit boring when simply cooked alone. However, when paired with fresh tomatoes, spinach, white beans, and a fresh lemon dressing, couscous is no longer boring. In fact, this light couscous salad can easily become the star of dinner! There is nothing complicated about making couscous salad. But the trick to making couscous taste good, is the seasonings. Lemon juice, olive oil, and fresh tomatoes flavor the couscous perfectly. 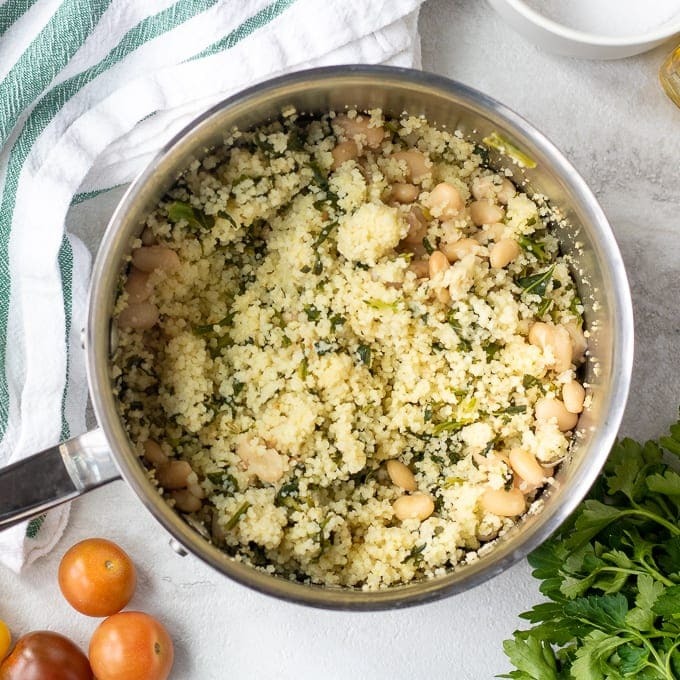 While spinach add nutrients and white beans make this couscous salad a bit heartier. Add in couscous, white beans, and spinach and mix well. Turn off heat and let sit for 5-10 minutes. Whisk together juice of lemon with olive oil, salt and red pepper flakes. Slice up roasted red peppers. Toss cooked couscous with dressing and toppings. Feel free to use fresh or frozen spinach in this easy side dish. Couscous salad can be served warm or cold. Omit the feta cheese for Dairy Free Couscous Salad, or change it up and use Parmesan Cheese. White beans are optional, but add a lot of texture, fiber and heartiness to this easy couscous side dish. 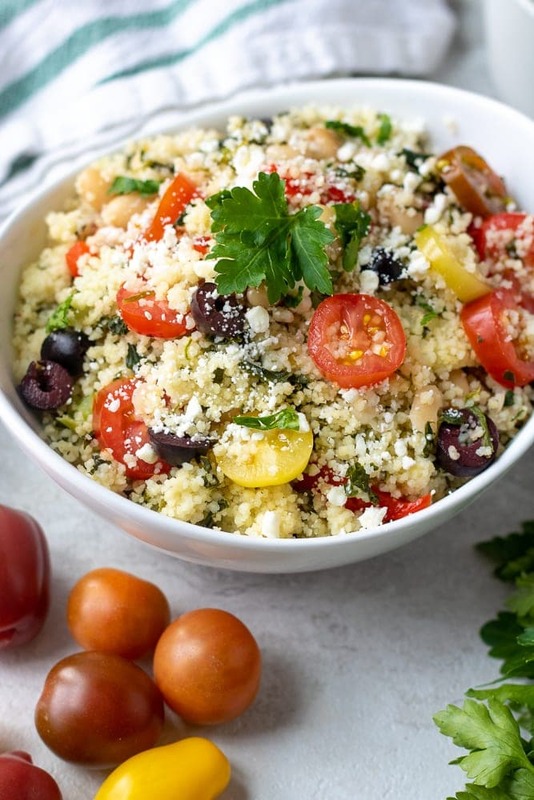 An easy couscous salad made with grape tomatoes, spinach and a bright lemon dressing. Stir in couscous, white beans, and spinach to boiling stock and cover. Turn off heat and let sit for 5-10 minutes. Once couscous is cooked, fluff with a fork and stir in olives, peppers, and tomatoes. Mix together lemon juice, olive oil, salt and red pepper flakes. Pour lemon dressing over couscous and toss well. Sprinkle with feta cheese. If using frozen spinach, add before bringing stock to a boil. What a beautiful dish Kristen! Love the roasted grape tomatoes and white beans. Couscous is quick and delicious. Now that my kids are in school to, maybe I need to be thinking outside the box about lunch! I love pearl couscous, too. It’s definitely a comfort food! Like you, I’ve been making lunches that I’ve been missing all summer because my son doesn’t enjoy them. This looks like one I should try! Love these flavors! I would love to have this for lunches! You need to make it! It is easy and tastes AMAZING!! Thanks Julie. I agree, larger couscous does not turn to mush! I’ve had couscous once or twice, but it didn’t appeal to me. I think I should give it another try as your recipe looks and sounds delicious! I like the sound of the roasted tomatoes, veg and parmesan in it, too! Thanks for the inspiration! Christina, I hope you do try–this has so much flavor! This is an amazing recipe, thank you! So glad you enjoyed Noelle! Thank you! This recipe has such a beautiful result! Love this recipe! YAY! Thanks for sharing your success Nellie!